Life in the 1800s was never better than aboard a steamboat headed down the mighty Mississippi River. Take your family to relive the days when living was easy on a cruise aboard an authentic steam powered sternwheeler. Choose from a brunch, dinner, or harbor cruise. If you choose to dine while riding, you'll get to enjoy a great menu, featuring classic dishes like Southern Fried Catfish, Gumbo, Maque Choux and more. All three cruises feature live jazz music, and there is no better place to for great views of the city and surrounding parishes. 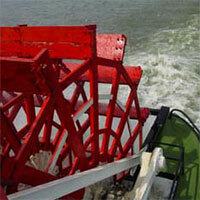 Riding on the steamboat, you'll have a great view of the New Orleans skyline. Even if you don't opt for brunch or dinner, adults can order alcoholic beverages, including the boat's fantastic Mint Juleps and Jazz Punch. And don't worry, there's sweet iced tea for the kids. Ask to see the engine room, which looks like it should belong in a museum. On top of the Steamboat, there's a musician playing a fully steam powered calliope! The calliope's music can be heard all over the French Quarter as passengers board the boat. 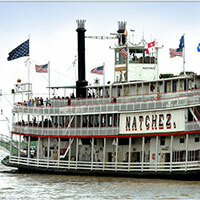 Natchez is one of the only five true remaining steamboats in the United States, and is a staple of New Orleans culture. For decades, the Natchez has paddled up and down the Mississippi River, showing off the city to passengers from all over the world, and to locals who just want to relax. So if you're looking for a truly New Orleans experience, then taking a ride on the Steamboat Natchez should definitely be on your itinerary. Natchez is one of the only five true remaining steamboats in the U.S. Relax with a slow glide down the Mississippi River during a 2-hout tour complete with live jazz music, Every Sunday, Steamboat Natchez offers a Jazz Brunch Cruise complete with favorite New Orleans brunch dishes including handmade beignets! Enjoy the traditional Steamboat Natchez slow jazz cruise down the Mighty Mississippi River and explore the city by bus with one of the best tour guides in the Big Easy.